This is Coach Sawyer's third season as head varsity coach. 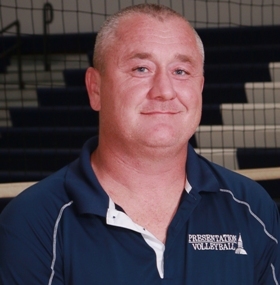 He has previously served as JV Coach, and prior to that he coached CSAA volleyball for 17 years. He has coached JVA/AAU/USAV club teams for 17 years. From 2007-2012, his teams won two bronze medals, two silver medals and a gold medal at the AAU National Championships in Orlando and a silver medal at the JVA National Championship in Louisville. ​He is Impact certified with USAV and has completed all three levels of the AAU Positive Coaching Alliance series. ​Kevin Lauersdorf has been coaching for Presentation since 2012. 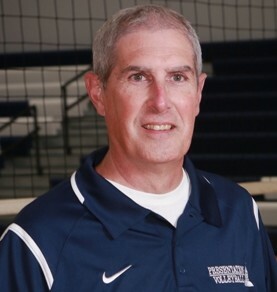 He brings over 14 years of Volleyball coaching experience. He is the co-found of Unity Volleyball and has been coaching club volleyball since 2006. Meghan Bowers serves as a freshman/junior varsity assistant for Presentation Academy. She attended Presentation and played varsity volleyball for three years. Meghan also played volleyball at Transylvania University. She has played Club Volleyball since 2004 (MAVA 2004-2008) and competed in the AAU Championships 2004 through 2009.